Joy joined BGA Thailand in July 2018 to help with the office’s rapid expansion. Her main duty is to tend to overall office functions and support the BGA Thailand team’s requirements for smooth and effective operations. Joy’s administrative career has spanned a variety of fields and has had an international focus. She has served as a logistics and warehouse control officer for a logistics company partnered with an American oil and gas company in Angola and as an overseas market assistant manager for a Bangkok-based international personal care products company. Most recently she served as an administrative officer for the board of directors at a commodities trading company based in Bangkok. Through these roles, Joy honed her multi-tasking skills and gained experience working with multinational colleagues in fast paced, globally-focused working environments. 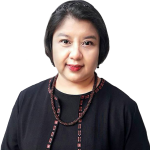 For nearly two decades, Joy has also worked as an accomplished freelance interpreter/translator for a variety of entities in the public and private sectors. She has worked with international entities such as the United Nations (Thailand Office), Pioneer Manufacturing (Thailand), Yaskawa Electric, Department of Electricity Supply (India), and the Office of Crown Princess Mahajakri Sirindhorn (Royal Projects Division). Joy is an avid cyclist, and enjoys exploring Bangkok’s many parks on two wheels in her downtime. Joy earned her bachelor’s degree in communications from the Faculty of Communication Arts at Chulalongkorn University, majoring in advertising.